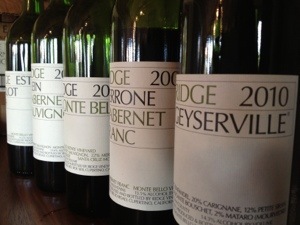 What was the last 78-point wine that you were impressed with? Leave a comment, and let us know. 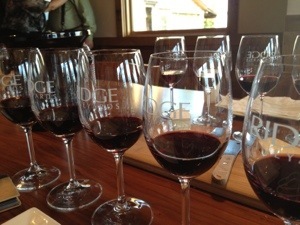 You know I love me some Ridge Vineyards. 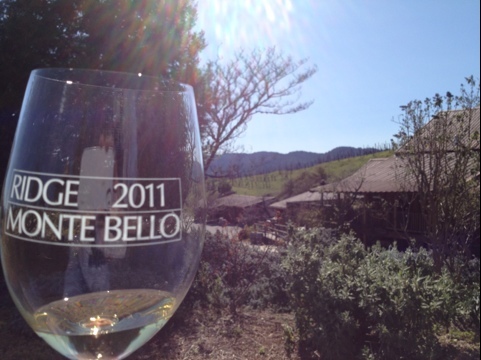 In 2011, Kara and I became members of their Monte Bello Collector program. 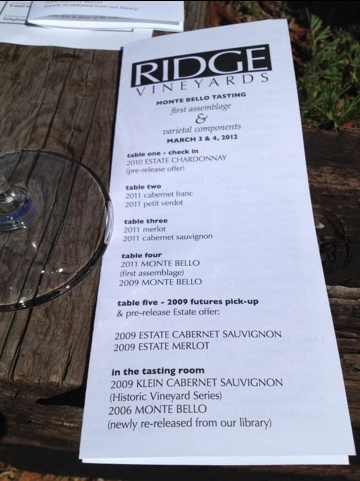 Along with being able to purchase their epic Monte Bello Bordeaux blend at a deep discount, as members, Kara and I get to go to some pretty awesome events. 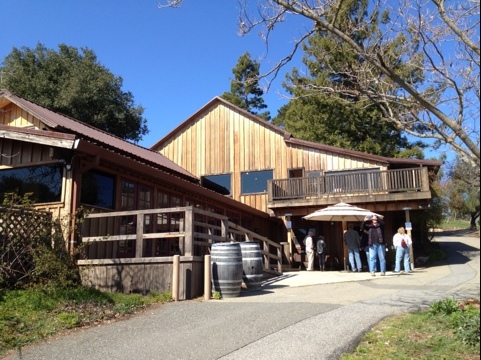 Saturday, we went to the First Assemblage and Component Tasting at their Monte Bello estate in Cupertino. 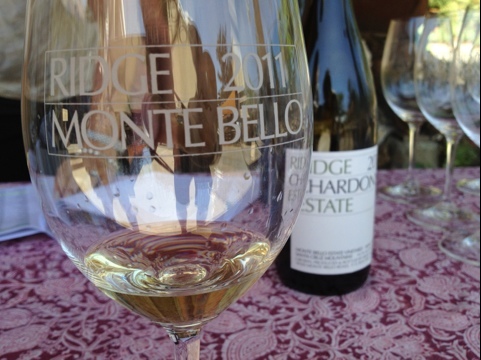 It’s a chance for prospective Monte Bello buyers to taste the individual varietal components of the blend, as well as a sneak peek at the 2012 vintage before it gets bottled up. 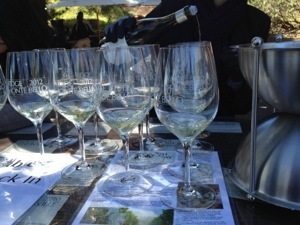 At check in, we were treated to a glass of the 2011 Estate Chardonnay. It’s loaded with lemon and minerals, all wrapped up in a cloud of creamy goodness. 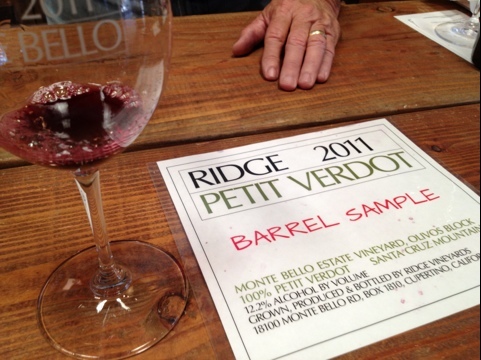 This is the 2012 Petit Verdot. It’s got coffee and cocoa on the nose. The mouthfeel is mad grippy. Some initial green flavors transition to fruit of cranberry and orange zest. 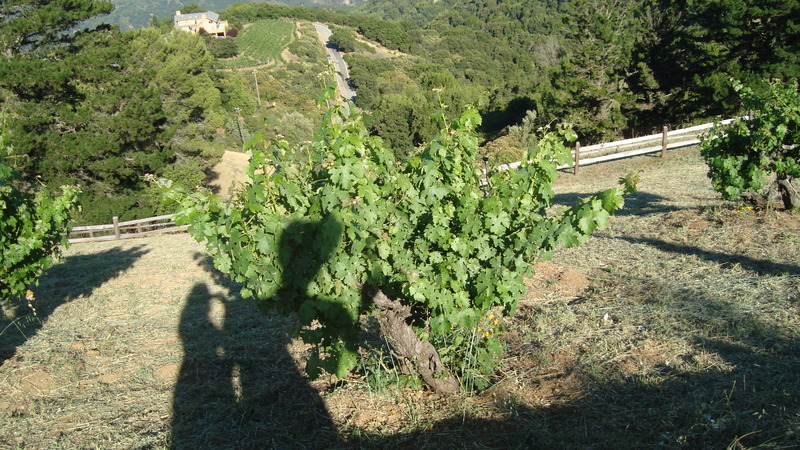 Here’s the 2012 Merlot. Super mocha and espresso on the nose. Big fruits of cherry and cranberry, with just a touch of grapefruit. Wow. 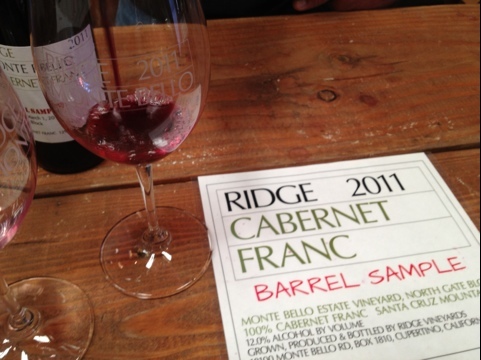 The 2012 Cabernet Franc had a super espresso and toffee nose. The wine was bright and fun, with a whole lot of raspberry and cranberry fruit. 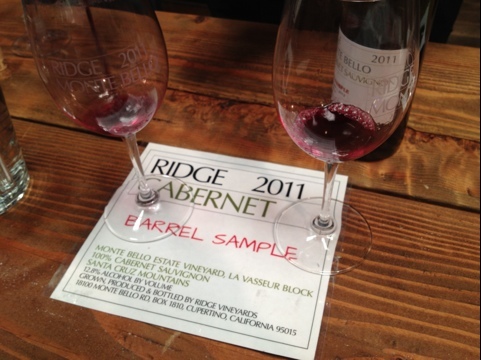 On the nose, the 2012 Cabernet Sauvignon gave notes of chocolate candy oranges. The palate was super bright with orange and raspberry fruit. Hella tasty! 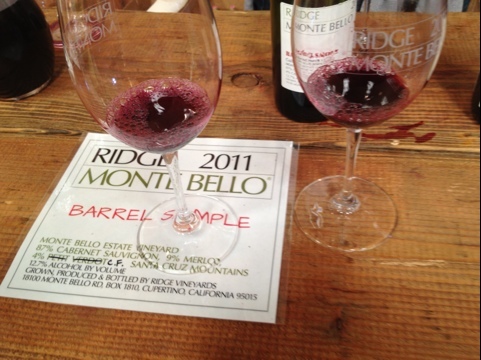 After tasting the components, I was excited to be among the first civilians to taste the primary assemblage of the 2012 Monte Bello. Here it is. 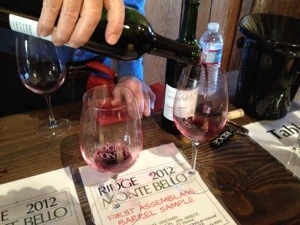 This is the Ridge 2012 Monte Bello, poured by one Paul Draper. I asked Paul if he was excited about this vintage. 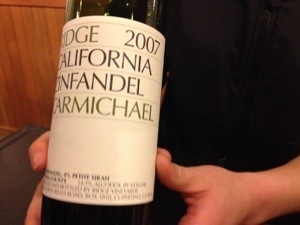 He said he was very happy with the big fruit notes on this wine. 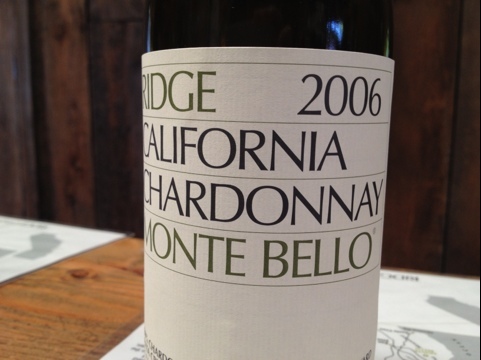 According to Paul, this wine will rival the 1997 and 2001 vintages of Monte Bello (That is a REALLY good thing). 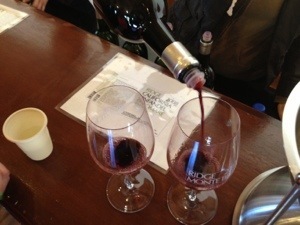 The wine is composed of 58% Cabernet Sauvignon, 26% Merlot, 8% Cabernet Franc, and 8% Petit Verdot. 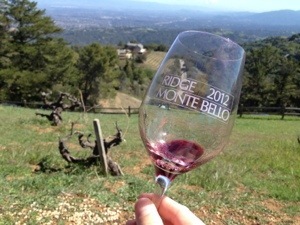 Of course, this young Monte Bello has espresso on the nose from the toast of the American Oak. 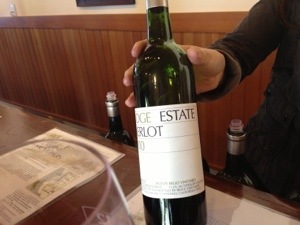 There is some massive bright red fruit on this wine, evened out with notes of tobacco and menthol. This wine is great. 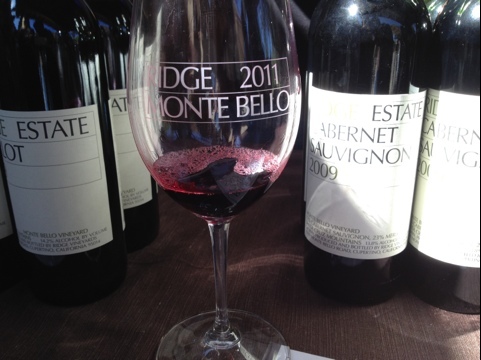 The Component Tasting is also the first chance for the public to taste the 2010 Monte Bello. 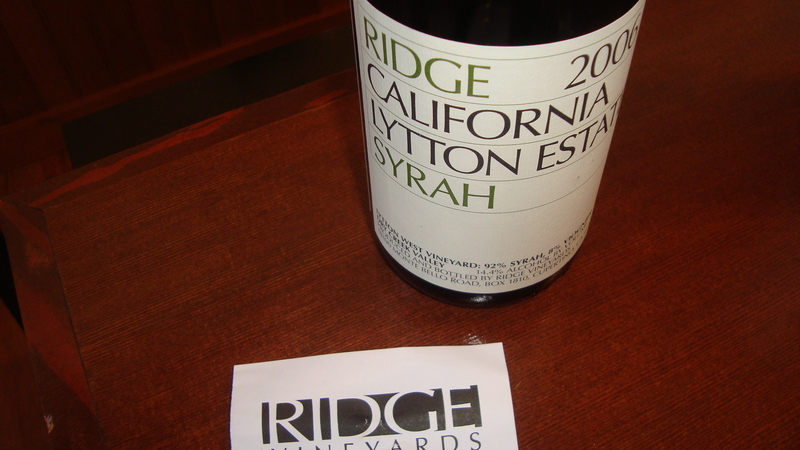 If you bought futures for this wine in 2011 (like we did), this is also an opportunity to pick up your wine. 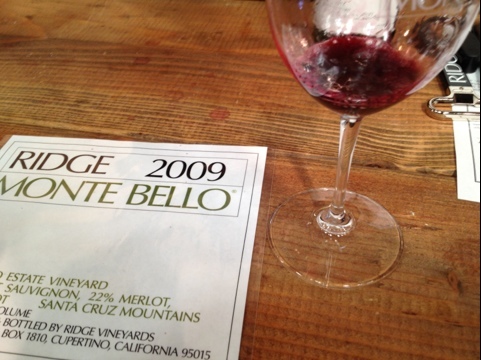 The 2010 Monte Bello has aromas of blackberry and plum. 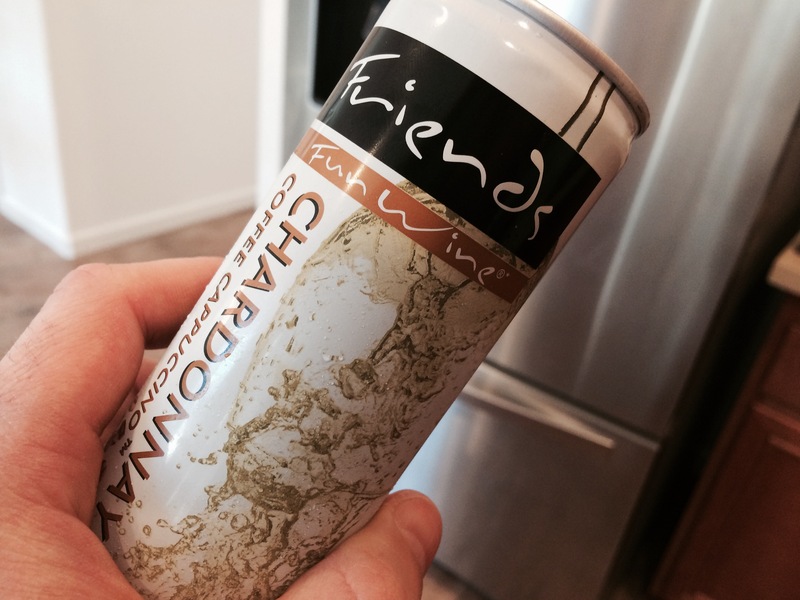 The wine has a great acidity, tasty cranberry fruit, and herbaceous tobacco notes. Mad sophisticated. Kara and I took our time enjoying this one. 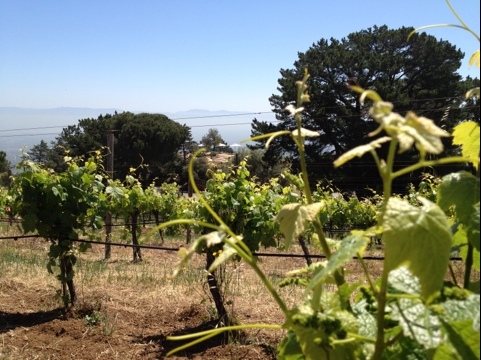 The 2010 Estate Merlot shows aromas of bright red fruit and baking spices. 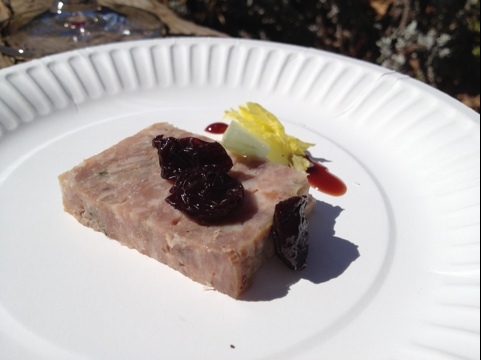 The palate has bright cranberry and raspberry fruit with some nice herbs. 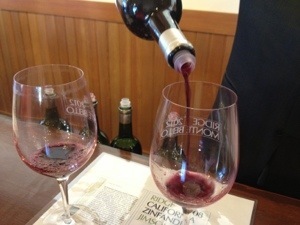 Here’s the 2010 Estate Cabernet Sauvignon. Big. Bright. Great mouthfeel. Pound for pound, this is one of the best Cabs around. 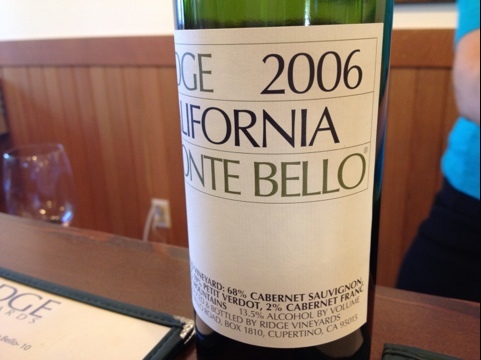 The 2007 Monte Bello has menthol and tobacco herbs, along with tomato and cranberry fruit. Very good. 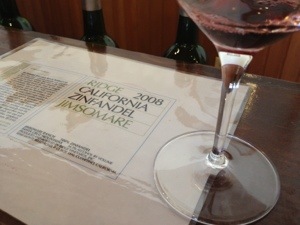 The 2008 Jimsomare Zinfandel is a rare treat. 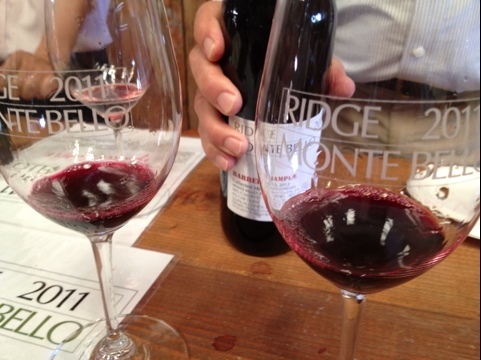 Bright and concentrated fruits of cranberry, blackberry, and raspberry, with an earthy balance. Good stuff. 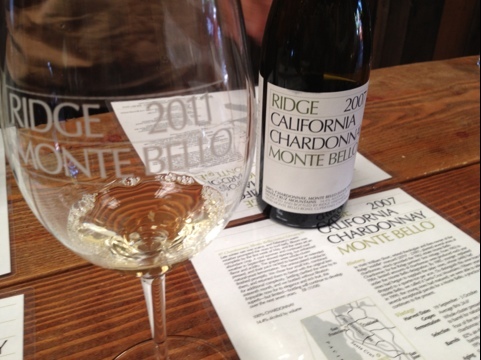 This magnum of Ridge 2010 Monte Bello fits perfectly in my wine fridge. Check back in 2035, and I’ll tell you how it turns out. 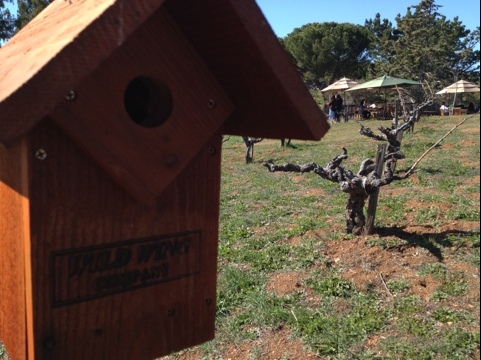 What’s your favorite wine event? 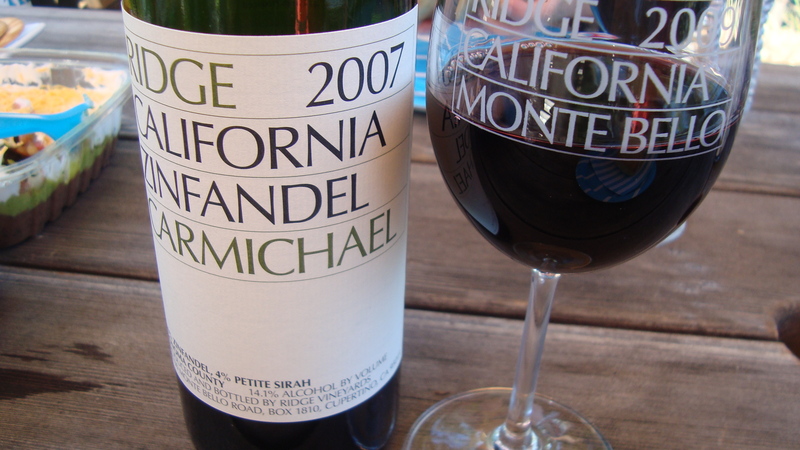 Have you ever purchased wine on futures? Leave a comment, and tell us what you think. 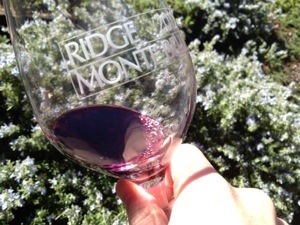 Since becoming members at Ridge Vineyards, one event that Kara and I really like taking advantage of is First Friday at Monte Bello. 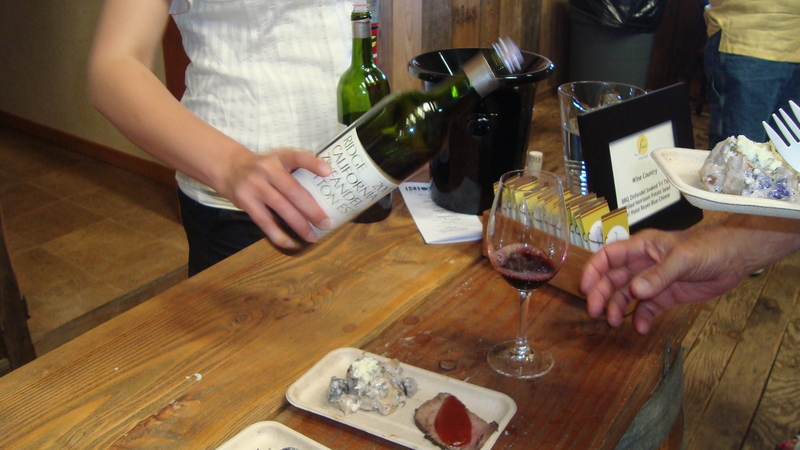 On the first Friday of each month, they present a members-only tasting that usually highlights a new release. 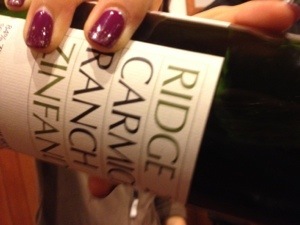 The Ridge 2007 Carmichael Zinfandel had a jammy nose of strawberries and blackberries. 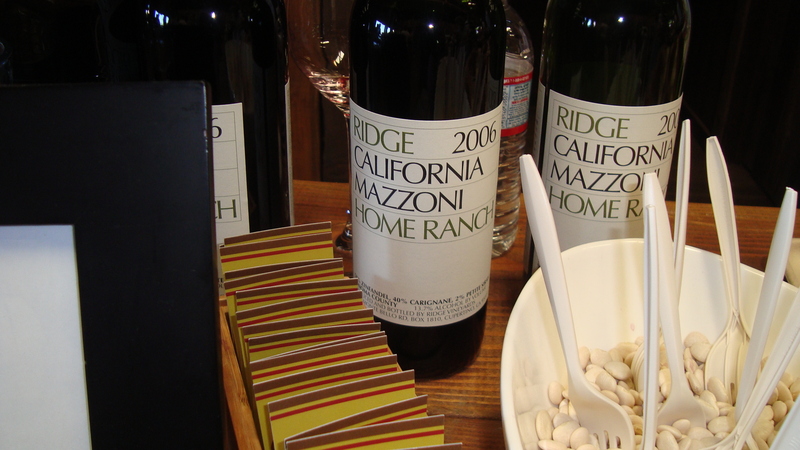 On the palate, this Zin had loads of bright, candied fruits of blackberry and cranberries. There was a nice funkiness to this wine as well. 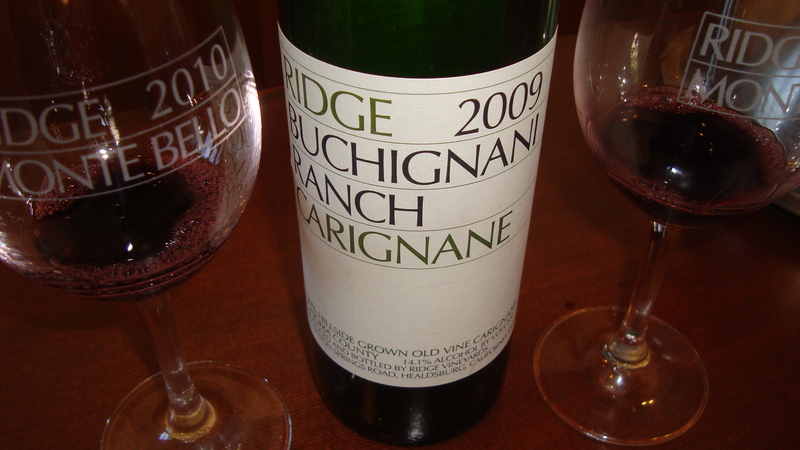 The Ridge 2009 Carmichael Ranch Zinfandel had a pretty nose of blackberries, blueberries, and tomatoes. The palate was mad earthy, and mad balanced. 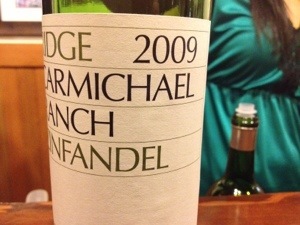 Newly released, the Ridge 2010 Carmichael Ranch Zinfandel was my favorite. The nose of mushrooms, plums, and blueberries was hella complex. 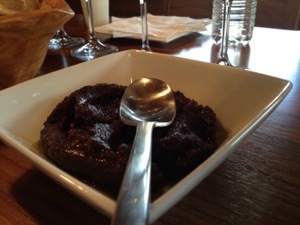 The palate had a bright acidity, powdery tannis, and flavors of plums and Earth. This was a real treat. And that was First Friday. 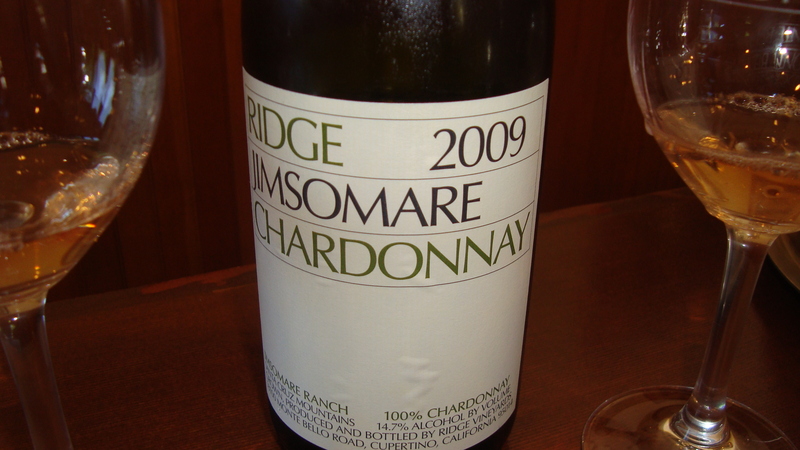 When I first started this blog in the Summer of 2011, I wrestled quite a bit with the idea of whether or not I would post scores in my wine reviews. The whole idea of quantifying something as subjective as one’s perception of a wine’s quality is straight up whack, son. I do score my wines. 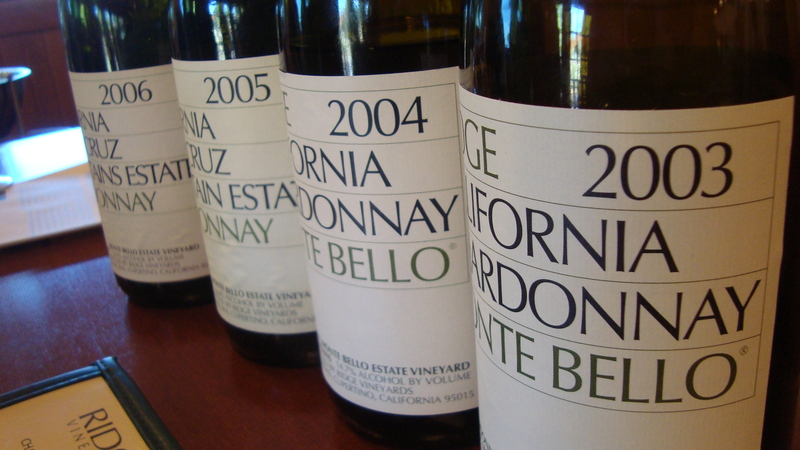 It’s an easy way for me to remember how I felt about the wines I have tasted. 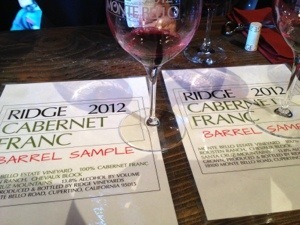 It’s also fun to compare my scores with those of other folks who have tasted the same wines. 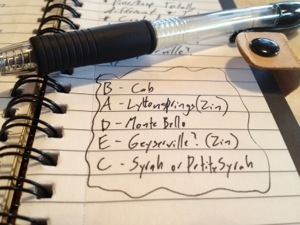 I’m not the only blogger who’s struggled with the idea of scoring wines. 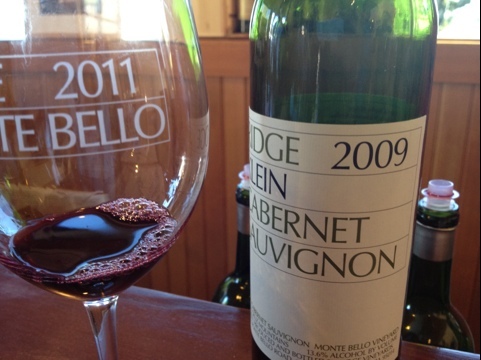 This past Sunday, I got together with a bunch of bloggers at Ridge Vineyards’ Monte Bello Tasting Room to tackle the very topic of wine scores. 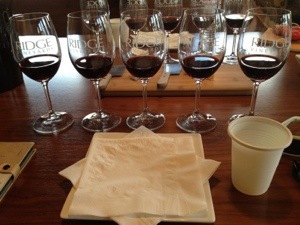 Five red wines and a spit cup. 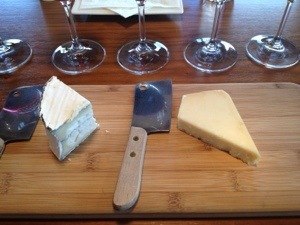 You should know that there is always a theme to these tastings… Always. You should also know that Blogger/Host extraordinaire, Christopher Watkins, always keeps the theme a secret… Always. That being said, based on my quick observations, it was easy to infer that we were gonna be going blind today. If you’ve seen any of my blind tasting videos, you know that I was gonna have to work hard on this fine Sunday afternoon. I had to fill my plate. 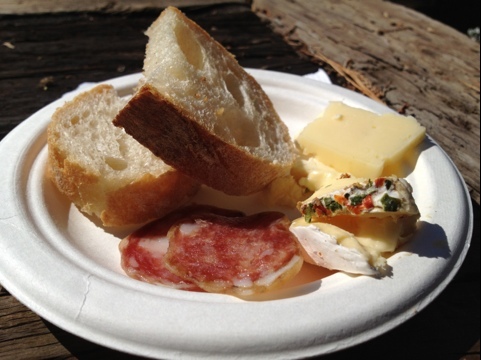 While snacking on some of the tasty bites, my eyes went back to the wines on my table. 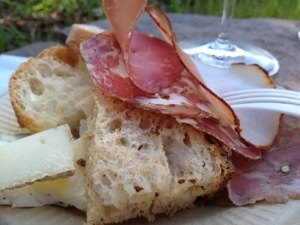 Christopher proceeded to break down the theme to this Blogger Tasting… “Scores”. 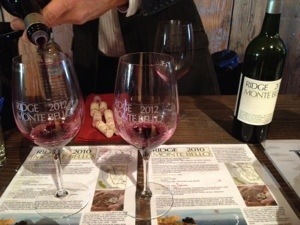 The five wines presented to us had all been recently scored by well-known and respected wine critics. 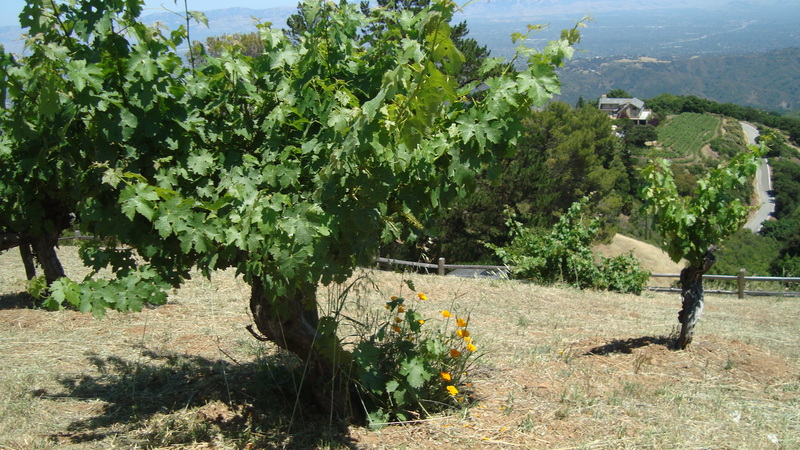 The difference between the top-scoring and lowest scoring wines is ten points on the 100-point scale. 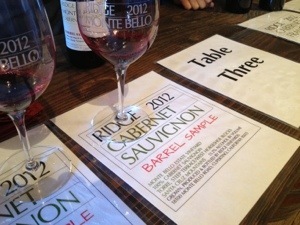 Our task was to taste each of the five wines, and rank them from our most favorite to least favorite. Christopher would then compile our scores, and crunch the numbers to get some (hopefully) meaningful data. 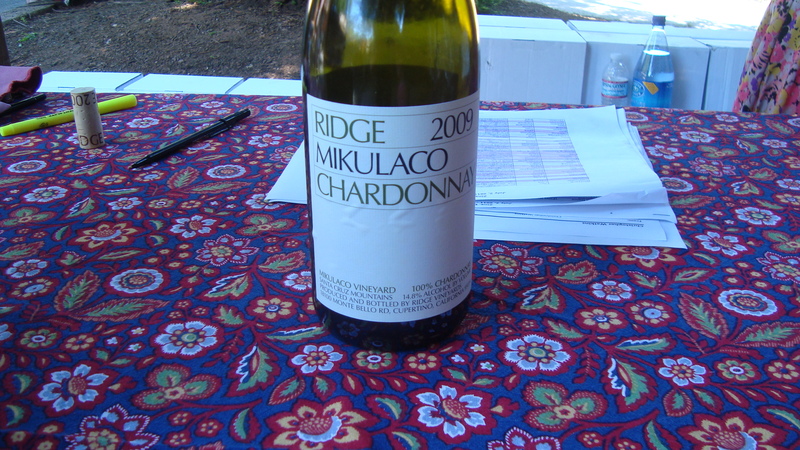 His hypothesis: While the scoring rubric (on a 100-point scale) may vary from one critic to the next (due to the subjectivity of taste), there must be similar valuations of wine beyond the subjectivity of a point score. So, if several bloggers are charged with ranking wines from best to worst, they should end up ranking them in the same order. Nose: Good fruit of raspberry and cranberry. It’s got a candy-type nose of rainbow sherbert. There’s also a hint of walnuts. 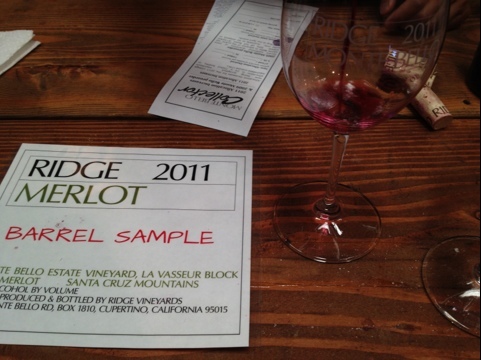 Taste: Bright red fruit with some funky Earth and orange zest. Color: Darker than wine A. Ruby red to purple. Nose: Subtle dark plum and tires with a hint of cinnamon spice. Taste: Plums and red fruit. 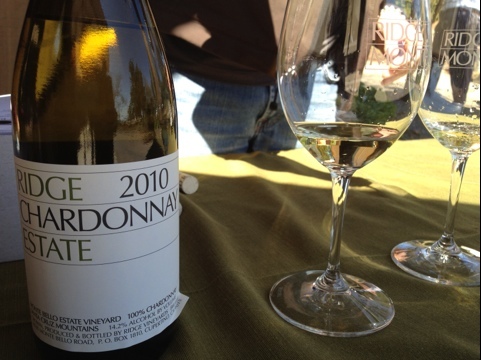 There’s a lively acidity to this. It’s complimented by cranberries, clove spice, and a touch of orange. Color: Dark ruby-red with some pink shimmers in it. Nose: Chalky blueberry and plum with hints of cocoa powder. 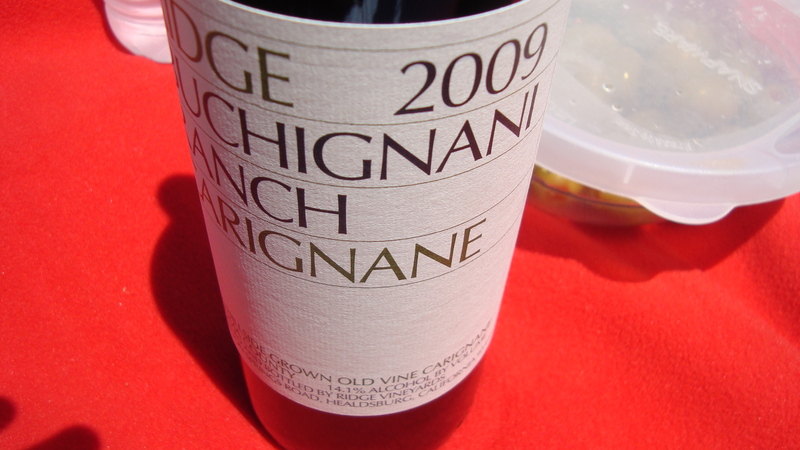 Taste: This wine has a BIG palate of ripe red fruit, pepper, and spice. Color: One of the lighter wines of the bunch. You can see your fingers through the burgundy red color. Nose: Very subtle. Good chalky notes, but that’s about it. 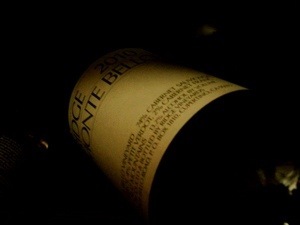 Taste: Again, a very subtle wine. Cranberries and raspberries compliment the good acidity to this one. 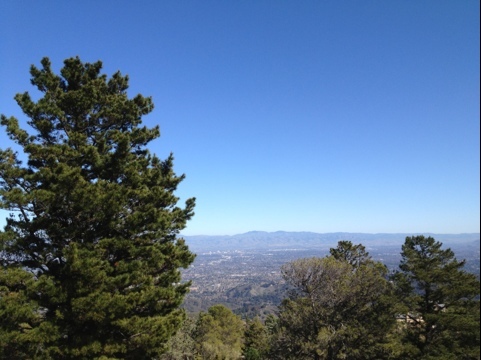 Color: Similar to that of D. Light burgundy. Nose: Lots of bloggers at the table were talking about the nose on this while I was still working on wine A. The nose is that of pine trees, raspberry, and something that was so familiar it drove me crazy that I couldn’t recall what it was. I’m looking forward to reading the notes from the other bloggers about this one. Super different and interesting. 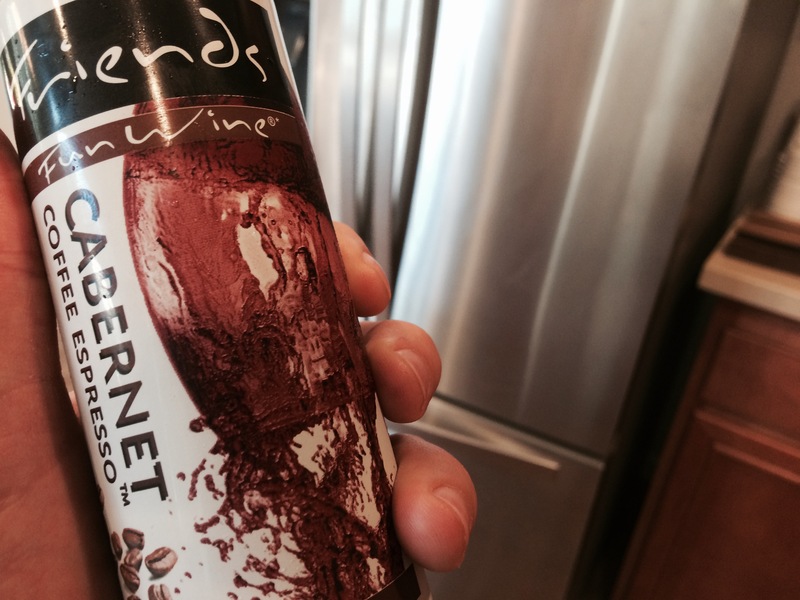 Taste: Off the bat, this wine tastes like a high alcohol Zinfandel. It’s got candied fruit roll-up, leather, cranberries, and grapefruit. Totally funky. Totally fun. My point spread was not anywhere close to as large as that of the critics in question. 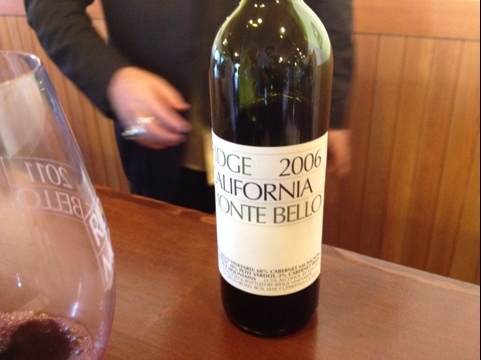 My favorite wine of the day came in at a 92+, and my least favorite was a 90+. 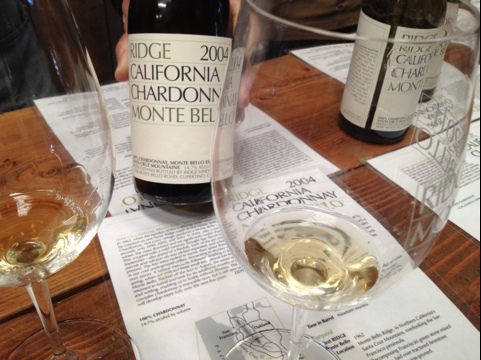 After sharing our rankings, Christopher gave us each a taste of the 1995 Monte Bello while he crunched the numbers. 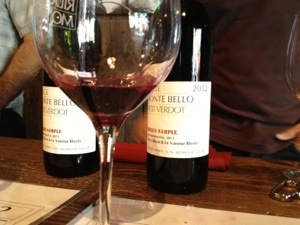 It was a fantastic wine with a good cloudy red color. 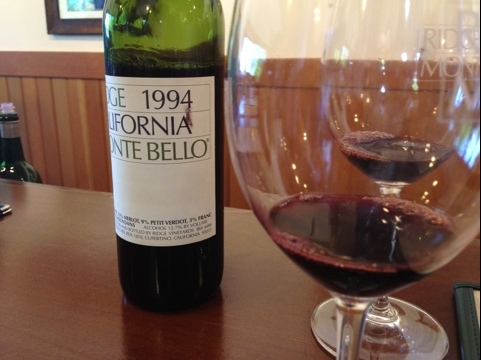 The funky good nose gave way to delicious blueberry and plum fruit and spice. A tasty 92+ in my book. 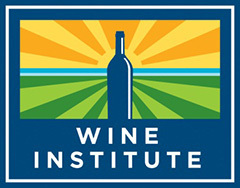 As it turns out, all of the wines were recently reviewed by Antonio Galloni. I have them listed them in the order in which I liked them. Galloni’s scores will be found in parentheses. 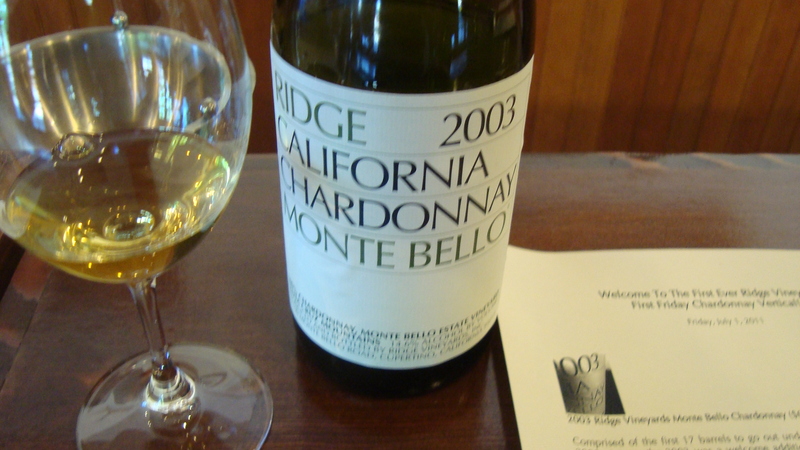 Galloni gave the Monte Bello a 98. 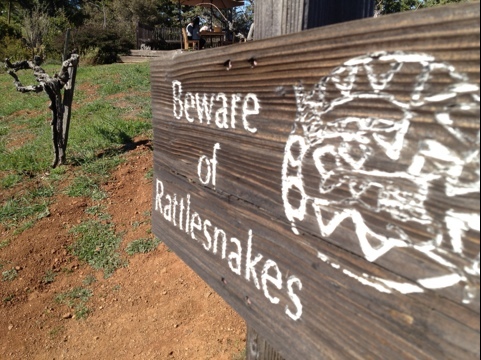 I liked it, but ranked it dead last… and I wasn’t the only one. I’m looking forward to seeing Christopher publish his data, but I recall him saying that 7 of us ranked wine C our least favorite. 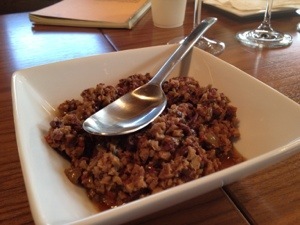 He also revealed that 7 of us ranked wine B as our favorite. Galloni did not taste these wines blind. 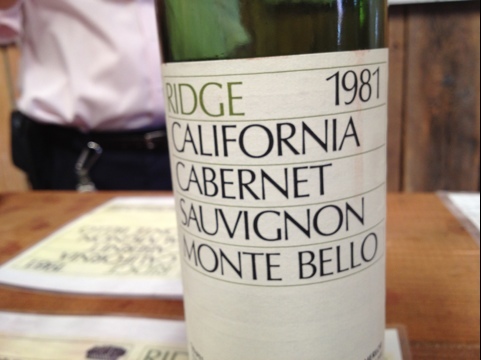 When it came to the Monte Bello, he knew that he was tasting a wine that was tasting a $150 from a legendary estate. He knew that he was tasting a wine that was meant to be laid down for 20+ years. Is it a 98 today? No way. Could it become one? Check back with me in 20 years. 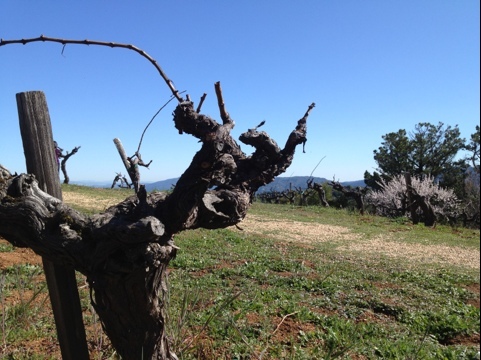 When it came to the Geyserville, Galloni knew the history of that vineyard. He has tasted several vintages of the wine. 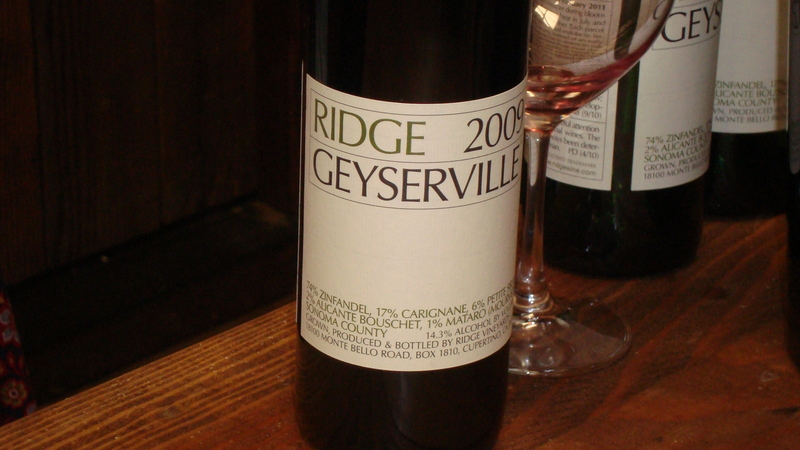 Is the 2010 as good as other recent Geyservilles? Probably not. Is it better than most wines that I would rank an 88? Definitely. The reality is that scores will always be subjective. 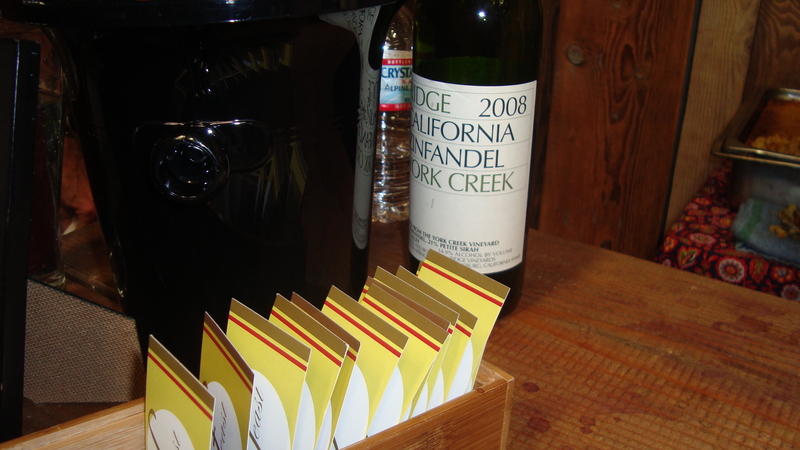 Scores will always rely on the context in which the wine is served. 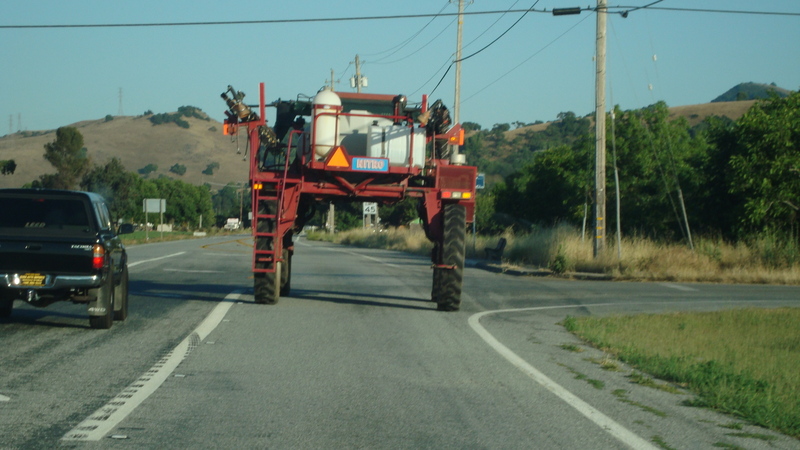 There will always be external variables that play a role in our perception of wine. At the end of the day, scores are what people want to see. Scores are what people want to compare. Scores are what people want to debate. It is because of this that I will continue to provide scores in my reviews. 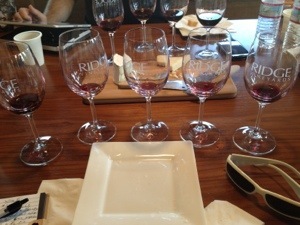 PS – Since this tasting was done on a Sunday afternoon, I missed the end of the 49er game. Could somebody tell me the score?